Starting with the DeLaigle’s in Saintonge, France, through their move to Champgerbeau, Champagne, France. The family stories passed down about our de l’Aigle ancestors of France are that they were originally from Northern France and fought in the Crusades. We hope to eventually find definite links between our de l’Aigle’s of Champgerbeau in the fifteenth century - to the Norman de l’Aigle’s who were with William the Conqueror in the eleventh century. Our immigrant ancestor Nicolas de l’Aigle brought the two-headed de l’Aigle crest when he came to America. The following information on our de l’Aigle ancestors are extremely well documented! Antoine de l’Aigle, lord de la Montagne of France, born ca 1450. He married Jeanne De Chesnel. The only child we know was Guillaume. 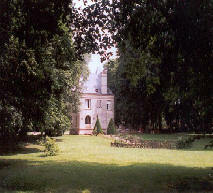 CHÂTEAU CHESNEL was built at the beginning of the 17th century near the city of COGNAC. 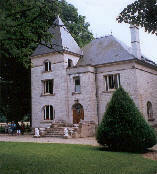 The descendants of CHESNEL acquired it by marriage and nowadays it belongs to the family of the counts de ROFFIGNAC. Under the reign of François I the domain of La Roche, situated north of the city of COGNAC, is being acquired by Jacques CHESNEL, the governor of the city of Cognac at that time. Thanks to its location near the river the Charente and to its fleet the city of COGNAC is in the XVIth century mainly being associated with the trade of wine and salt. Read more about the Chateau Chesnel. Guillaume de l’Aigle, son of Antoine & Jeanne, was also called lord, or sire de la Montagne, and would have been born ca 1475, we believe in the parish of La Predier, then afterward of St. Ciers-Champagne (Charente-Maritime). Guillaume first married Anyse D'Authon, daughter of Pierre d'Authon, Chevalier, Lord d'Authon, (panetier du roi), Captain of Marennes and the islands (on the Atlantic coast near LaRochelle) and of the Souveraine Flamenche. Anyse was the sister of the famous Antoine, Chevalier, lord d'Authon. Antoine d' Authon, gentleman Saintongeais, became the Barberousse corsair, king d' Alger, admiral of the fleet Ottoman and Minister for the sea of Soliman the Magnificent. Guillaume’s second marriage was to Clair Duga, daughter of Arnaud Duga, Squire, Lord of Chatelars, parish of Meursac (Charente-Maritime); Trisaieu of Pierre Duga, Sire of Mons; Lieutenant General in New France. Responsible for enterprises that resulted in the foundation of Acadia and of Quebec. 2) Claude DE L'AIGLE - Priest, Prior of Epineuseval from 1540 to 1544. Resigned the priory in favor of his nephew, Claude De l'Aigle. 3) Jeannot DE L'AIGLE, lord Of Touvenac - Squire, Lord of Touvenac, parish de St. Ciers-Champagne (Charente-Maritime) and in part of La Montagne. Jeannot and Blanche had one daughter. From a letter written by Robert Brueillard, Deuil La Barre, France, March 31, 1995: "I went to Berneull (Berneuil-en-Barbezieux) a little town in Charente, where the fief of "La Grange" or Les Granges" was situated, this was the property of Jean De Laigle, second brother of Jacques, our ancestor who settled in Haute-Marne and became lord of Champ-Gerbault. Jean and his descendants have been living there from roughly 1600 to about 1770. It has been impossible to find the place, the city hall was closed and the residents were barricaded in their houses to protect themselves against the torrential rain. The only fine place I saw is Meux castle, which was the residence of the lord of Meux allied to the De Laigle family during the 15th century. Unfortunately, it can be visited during summer months only." We can but wonder if any of our ancestors were at the battle at Pavia, Italy... Feb 24, 1525. Perhaps that is why we know so little about some of the sons of Guillaume de l'Aigle & Anyse d'Authon. Were some of them there? One of the interesting things was that Francois de Lorraine (1506-1525) was the Lord of Lambesc, and a commander in the French army under Francis I of France. He commanded the Black Band of renegade Landsknechts at the Battle of Pavia, and in the bitter combat that ensued between the Black Band and Frundsberg's Imperial Landsknechts, Lorraine was killed. Perhaps this was the start of our relationship with the Lorraine/de Guise family (unless it all started prior to this!) Note: Diane de Poitiers was the grandmother of Charles de Lorraine, duc d'Aumale (1555-1631)... Her daughter Louise de Breze married Claude de Lorraine, duc d'Aumale (1526-1573). 2. Jean DE L'AIGLE (son of JEAN). Archives historiques de la Saintonge et de l'Aunis: cartulaire de Saint-Jean d'Angély By Société des archives historiques de la Saintonge et de l'Aunis : Testimony of Charles de Meaux, seigneur de Fouix, au seigneur d'Arvert, le 28 may 1649. (4) Footnote: Predecessors of John Michel, the Vidaud and of Laigle. Jean married Anne DE POCQUAIRE on 20 Jun 1599. (Translation): CHARLES of POCQUAIRE, escuyer, Sr of Cormiand? (def.) Perhaps Charles de Pocquaire, married to Gabrielle Arnaud, and who seems was son of François de Pocquaire, and Marie of Chassagne. - Pocquaire: of money, with 5 rockets of mouths in fasce. - It is undoubtedly necessary to read of Cormier, commune of Cherves, close Cognac. Jean and Anne had one son we know about: Gabriel DE L'AIGLE seigneur de la Verennerie. 3. Gabriel DE L'AIGLE seigneur de la Verennerie (Jean, JEAN). Charles de Meaux, chevalier, seigneur de Rudefontaine, de Douy-La-Ramee en partie et du Fouilloux, ne en 1603, fils de Mery de Meaux et de Madeleine de Vassault, se maria en 1629. Sa femme était fille de Jacob de Lezignac, seigneur de Marlonges, et d’Isabeau de Comminges, dame du Fouilloux. Cette seigneurie ayant été decretee et adjugée a demoiselle Anne Gombaud de la Croix, pour la somme de 26,500 livres. Marguerite-Melanie du Bourg, en sa qualité de proche parente (elle était fille de Mélanie de Meaux, dame de CHASSAGNE), la revendiqua, en 1715, par droit de retrait lignager. (Translation) Charles of Meaux, knight, lord of Rudefontaine, of Douy-It-Ramee some left and Fouilloux, not in 1603, sons of Mery of Meaux and of Madeleine of Vassault, itself maria in 1629. His woman was girl of Jacob of Lezignac, lord of Marlonges, and of Isabeau of Comminges, lady of the Fouilloux. This seigneurie having been decretee and auctioned has girl Anne Gombaud of the Cross, for the sum of 26,500 books. Marguerite-Melanie of the Town, in his quality of near parent (she was girl of Mélanie of Meaux, lady of CHASSAGNE), the revendiqua, in 1715, by collection right lignager. 4. Joseph DE L'AIGLE seigneur des Granges (Gabriel, Jean, JEAN) was born 29 Aug 1648. Rough translation of text from source: Jozeph of Laigle, escuier, des Granges lord, there remaining, age of fifty-three years, possesses the fief of the Barns and celluy of the Melloire, aveq of the agrieres of 200 income books. Footnote: Joseph of Laigle, lord of Granges, son of Gabriel of Laigle, lord of the Verennerie, and of Suzanne Nourigier, married, February 15 1680, has Marie de Saint-Mathieu, maintained by Begon the April 1699. Warrant given in Joinville, November the 10th 1550, by the dowager Duchess de Guise, signed Antoinette and countersigned Rochereau, whereby she hands over the seigniorial privileges owed by her son the Duke d'Aumal to his servant, Sir de la Montagne after he acquired the fee of Champ-Gerbault. Declaration of allegiance and homage dated November the 14th 1551 signed Colart, clerk of the court of Saint-Dizier, and sealed, done by Jacques de la Montagne, squire, servant of his Grace the Duke d'Aumal because of his estate and seigneury of Champ-Gerbault, purchased from the said Duke. Another declaration of allegiance and homage dated Feb the 23rd 1553, signed by the same Colart, and sealed, done by Jacques de la Montagne, living in Louvemont, squire, servant of his Grace the Duke d'Aumal because of the said seigniory of Champ Gerbault. Contract dated May the 20th 1563, signed Royer and Confinet, notaries in the provostry of Wassy, and sealed, concerning the exchanged done by Jacques de l'Aigle, said la Montagne, squire, lord of Champ-Gerbault and Lady Genevieve de la Mothe his wife, living in Louvemont, of the inheritances and seigniories owned by the said Sir de l'Aigle, in Saintonge on behalf of Rene de Saint Ligier, squire, lord of Boisson, and Lady Peronne de Pradelle, his wife. On the back of this contract appear the ratifications and other acts signed by the royal notaries and the parties. Transaction dated Nov the 18th 1571, signed d'Auscure and Godechal, notaries of Joinville, and sealed, between his Royal Highness the high and powerful Price Henry de Lorraine, Duke de Guise, Prince of Joinville, high governor of France and Jacques de la Montagne, squire, lord of Champ-Gerbault, living there. Transaction whereby in consideration of the services rendered by the said Sir de la Montagne to the high and powerful Prince Claude de Lorraine, Duke de Guise, his grandfather and of the services he and his children continue to render in the opinion of high and powerful Princess Lady Antoinette de Bourbon, dowager Duchess de Guise, and of His Royal Highness and His Eminence the high and powerful Prince and Cardinal Louis de Guise, the said noble Duke de Guise sells a forest called Le grosse haye de Champ-Gerbault to the said Sir de la Montagne for the sum of one thousand pounds. Declaration of allegiance and homage into the hands of the bailiff of Saint-Dizier, dated November the 15th, 1574, signed Marchand, clerk of the court, and sealed, supplied to the king by Nicolas de la Montagne, squire, lord of Champ-Gerbault, captain and governor for the king of the town and castle of Tallan, gentleman servant of the queen of Scotland, dowager of France, and squire of Madam the Duchess de Guise, because of the said seigniory of Champ-Gerbault fallen to him after the death of his father Jacques de la Montagne, living squire, lord of the said place. 2) Nicolas DE L'AIGLE, lord of Champgerbaux (d.between 2/6/1596 & 8/30/1598) - Squire, Lord of Champgerbeau, Captain of Tallan, Squire of Henri de Lorraine, Duc de Guise; Squire of Catherine de Cleves; gentleman servant to the Dowager Queen of Scotland. One son, Jacques, Squire, Lord of Champgerbeau, died without descendants. Nicolas and Magdeleine may have had other children, most likely daughters. Nicolas de l'Aigle la Montagne, squire, lord of Champ-Gerbault, captain and governor of the town and castle of Tallan, gentleman servant of the queen of Scotland and squire of the duchess de Guise, who left himself from Lady [Diane] Magdeleine de Poitiers his spouse, Lady of Estrez, Mailly and other places, Jacques de l'Aigle, squire, lord of Champ-Gerbault, his only son who died not married. | sp: Magdeleine DE POITIERS, Dame Du Pressoir - Magedeleine de Poitiers was undoubtedly related to Diane de Poitiers, but exact relationship not confirmed. Premarital agreement dated December the 4th, 1574, signed Confinet and Paillard, notaries in the provostry of Wassy, and sealed, between Antoine de l'Aigle, said la Montagne, squire, gentleman servant in the House of His Grace de Guise, son of the late Jacques de l'Aigle, said la Montagne, squire, lord of Champ-Gerbault; and Lady Perrette de Marc, daughter of Michel de Marc, squire, lord of Brousseval and Lady Jeanne d'Aillancourt. Agreement approved by Lady Genevieve de la Mothe, mother of the said Antoine de l'Aigle and widow of the said deceased, by noble and scientist Claude de l'Aigle, said la Montagne, prior beneficiary of the yield of the prior of Notre-Dame d'Epineuseval, by Nicolas de l'Aigle, squire, Sir of Champ-Gerbault, captain and governor for the king of the town and castle of Tallan-le-Dijon, his brother, and by Jean de Briseur, squire, gentleman servant of the king's House, his brother-in-law. Letter of the king Henry the fourth, said Henry the Great, dated February the 6th, 1596, signed Henry and countersigned Potier whereby His Majesty shows to the Sir de l'Aigle the satisfaction he has of his services. Antoine married, by contract, Dec 9, 1574, Lady Perrette de Marc, daughter of Michel de Marc, squire, lord of Brousseval, and Lady Jeanne d'Aillancourt. Divided the property with his wife. 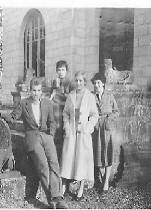 Living at Avranville, where the de Marc family had an estate. The interesting thing about Perette is that her family were Protestants. They did not marry until after his father, Jacques de l’Aigle, had died. 1) Charles de l’AIGLE (b.7 Mar 1584-Avrainville (Haute Marne),France d.By 1639) Probably died young. In 1595, Jacques is listed as the eldest son. 2) Jacques DE L'AIGLE (never married) (b.8 Nov 1585-Avrainville (Haute Marne),France d.By Jan 1639). Jacgues never married. His godmother was Magdeleine de Poitiers, Dame du Pressoir. Given possession of Champgerbeau August 31, 1598, which reverted at his death to his brother, Pierre. Deed of the bailiwick of Saint-Dizier, dated July the 8th, 1603, signed Marchand, clerk of the court, acknowledging receipt of the enumeration of the estate of Champ-Gerbault supplied by Jacques de l'Aigle, lord of the said Champ-Gerbault. 6) Francoise DE L'AIGLE (b.Between 1595-1597-Avrainville (Haute Marne),France). Birth date(s) of between 1595 and 1597 according to a statement of August 9, 1628. Married before 1618 to Andre de Barizier, squire, called Sire de Marne, living at Avrainville. Note: There are several de l’Aigle daughters who need further research. Any help appreciated!